English language arts is a vast subject area, encompassing many different sub-fields, including: Composition and Rhetoric studies; Linguistics and grammar, Literature and Literary theory, Speech and Performance; Dramatic Arts; and Digital Literacies. Our modern educational system demands from teachers not only the established norms and functions of the traditional English language arts curriculum, but also a strategic and developed introduction into the globalized marketplace, where the modern demands of technological savvy and the respect and understanding for voices not like our own are played out. Please find my sample lesson plans from each of these differing sub-subject areas under the associated tabs. 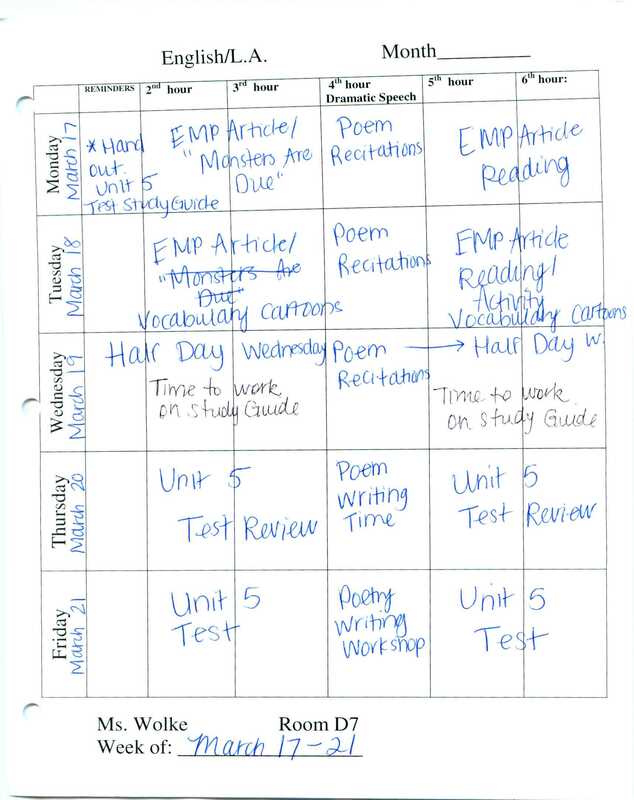 Below, also, find my 7th grade Weekly plan for including several of the sub-areas in a typical week, as well as evidence of my understanding of the English Language Arts classroom as a necessarily dynamic space wherein revisions to the schedule are a necessary and important component of the ELA classroom.